I am using an OP4177 in an externally powered application (voltage follower for battery cells). Is it OK to leave the voltage input from the cells connected when the supply power is off? What is the state of your supplies when it is powered off? Is it grounded or floating? Please also take a look at the ADA4177. It has higher bandwidth, lower noise, and has integrated overvoltage protection. Are you using the amplifier to monitor the battery voltage? Many thanks Kris; that is most helpful. I have a 1k on each input. and the current power-off is about 1 mA. 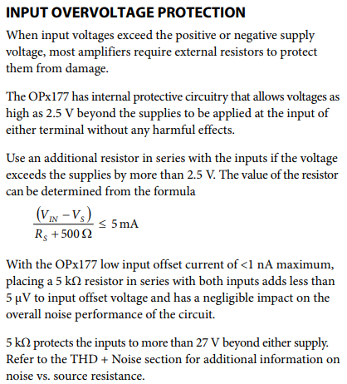 Yes I am using the OP4177 as a voltage follower to monitor battery voltages without drawing power from the cells.